A change of view today, as I thought it would be interesting to take a look at the weekly chart for the yen to dollar forex pair, which provides a different perspective following the long sideways consolidation of the last few months, which now appears to finally have come to an end. In particular it is interesting to note the series of lower highs and lower lows which I have indicated on the chart with the blue trend lines. 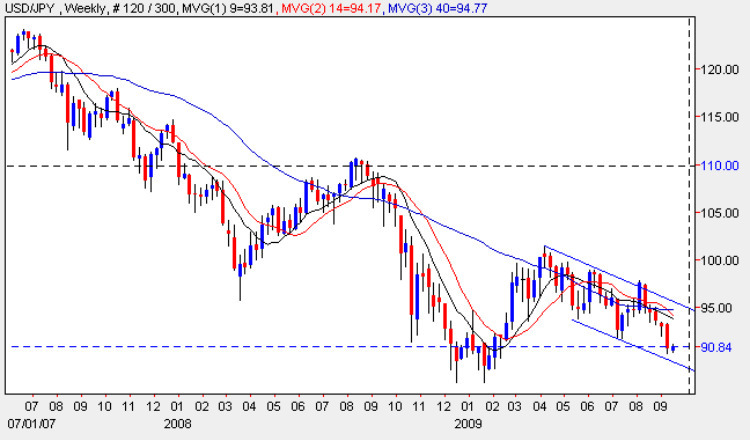 With the downwards trend now firmly established the only question technically is whether we will see yen to dollar break below the lower support line, or bounce higher within the trending channel, as we begin to approach the 87.00 price point where the previous move lower failed in early 2009. Last week’s wide spread down bar added considerable momentum to the bearish picture, and with all three moving averages now weighing heavily, we should see a deeper move in the yen to dollar pair in due course. The only caveat on this forex analysis is that many forex market analysts are now suggesting that the US dollar is heavily oversold, and with the next G20 meeting due shortly, some member countries could begin to apply pressure to the US to change their rhetoric and stance on dollar, which could result in sudden reversal in the yen to dollar pair. For now however, the trend seems well established and whilst a longer term trading opportunity, selling into the trend on any upswing near the upper trend line would seem to be the favoured forex trading strategy for the medium term.